Ok, someone asked for a "What's Different" contest so here it is! 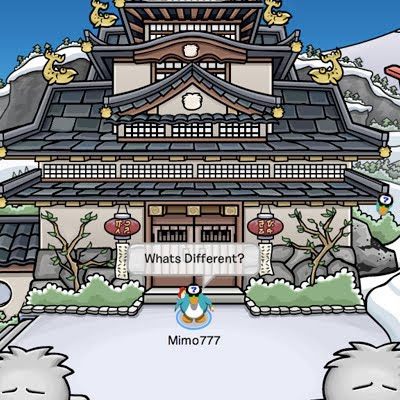 See if you can spot 11 differences between this picture below and the real Club Penguin Dojo! Some are hard, some are easy. Some of you will get them all. Some of you won't. Leave a comment and list all 11! And see if you can do with without cheats. ;-) No emails please. See if you can be one of the top 50 posting the correct answer! I'lll post the right answers in a couple days. ONE OF THE BETTER NEW GAMES WE'VE FOUND! GARDEN PARTY WORLD! PLAY NOW FREE! mimo i know what is different the in one place there was a puffle but you put your face. Haha tricky mimo. I'll send mine in soon lol. cool! im going to start now, but do you win anything? oh only 1 i will win! Hmm, tricky! Ill try to get to the scoreboard this time! hey mimo i like this idea of this contes but i only found 2 things. any way im a big fan! hey mimo im a big fan! Hehe mimo, I've found 7 so far. I have a question. Do you list the things in 1. 2. 3.? or like in sentances? Thanks Sprocket07! You were a great help! In the picture of mimo and the dojo it seems as if the picture is way duller as in lighter color that the real dojo. So does that count as a difference? Mimo this is very hard!! i love good challenges i only got 9 so far...Hey everyone try your BEST! Yeah, um Mimo. Your penguin's face is over that bush. Hellos!As you can see in other of mimo's pics,they r lighter than they look in cp cuz there might be something happening when he takes his pictures,so it doesnt count.Hope you find out the answer! No mimo will list the first 50 correct guessers ;-) so you still got a chance! WOW MIMO! I simply can't do it. Will keep trying though! You have to get all eleven first! Please don't give us the answers. People like a challenge! I don't know about a prize as such but if you are in the top 50 your name will be listed. Good luck! But fifty get their name on the list! dude, i got only 9... :(( I won't make it! I have found 3! I beat you. Yay! I am a big fan too! 1.2.3. would be easier for Mimo to read! Man, 1 more. This is hard. mimo i know what is different the in one place there was a puffle but you put your face and the fish its the wrong way the bottom right. it would probably be easier to put it in 1. 2. 3. OH YA!i got nine so far!!! yeah I noticed that too. I was wondering also. There was a puffle but you put your face on the right side of the dojo. i have only found three out of eleven so far but i wont give up! i have only seven out of eleven! nice job with the contest! i've found 7 so far im a big fan! Hey icey just to let you know you need to find 11 things, not ten. Good luck! Good look remember to look carefully as some are tricky. Congratulations to the winners so far...This is a real Challenge! Youll make it! Just keep going! Nope not this time it's just for fun! Cool, I will try but it seems very hard! Well Mimo didn't say but I guess he would find it easier if you did it in numbers. Good luck! Wait to find out if your name is put on the list! I need a new poll! Actually 50 will win, but 1 will be first! Congratz Littles08, and the other weiners so far! You will get your name posted on the site with the other weiners. Good luck! you replaced a puffle with your head! it was pretty tricky! You Don't win anything you just gt put on the list of the first 50 ppl that get it right. It's kinda just for fun! It's OK if u only got two right! Keep trying u can do it it's always OK if u don't win! P.S u better send your answers in soon cause only the first 50 people will be on the list. 6 is actually pretty good! i could only find like 4 but i'm not sad. keep trying you'll get it eventually! Good spot! but don't tell the answers don't feel bad i'm just sayin it. lol! No, it doesn't count. It's probably because of mimos computer or because of the lighting dif on club penguin. I found 3 things! It's inpossoble! awww u started school? I'm not starting for a few more weeks..... :-D Yay! Congratz to the other winners too!! OMG I WON!!! Yay I have never won one of your contests mimo! thanks so much.....!!!!! GO MIMO! Yahoo Mimo i won for first time!!!! i got all of them right!!! everyone just think and try your best! Thank you Mimo777 for letting me win! You are the best Club Penguin player! Mimo , I am very , very happy because I won the contest . This contest was hard . In 30-35 minutes I discoverd the answers .Thank-you very much , Mimo ! Loving the wapedness! ;-] Congratulations to you and all the other lucky wieners. I won too! The bottom right puffle that's supposed to be there isn't and instead is mimo's face. good contest!! It was hard kinda but i got some! New Club Penguin Pin Cheat - KOI FISH PIN! Back to School and Club Penguin? Snow and Sports Catalog Sneak Peek! The Club Penguin Mimo Party Was So Very AQUA! Final Club Penguin Mimo Aqua Party Clue for You! Club Penguin Underwater Adventure Update! Club Penguin Mimo Aqua Party Clue 3.2! Club Penguin Gary The Gadget Guy Mimo Tracker! New Club Penguin Pin Cheat - SAND CASTLE PIN! 200th Club Penguin Times and Festival of Flight! Aqua Mimo Club Penguin Party Clue #2! Screenhog's Festival of Flight Sneak Peek! Club Penguin Mimo Song Contest Winner! UNBELIEVABLE! WE BROKE THE WEBOSAURS BRIDGE! Play Your Music At Club Penguin Lighthouse! Mimo Club Penguin Aqua Party! Sa-WEET Secret Mimo Webosaurs Party! New Secret Mimo Party coming soon! Club Penguin New Furniture Vote! Club Penguin New Party Sneak Peek! Where did the Club Penguin Ninja go?